An emotional week for Eileen Cullen ended with Courtown claiming its first national pennant with victory in the AIG Junior Foursomes Final at Knightsbrook. Following the death of her husband Michael on the eve of the District Finals, Eileen rejoined the team for the All Ireland finals and she came home a winner with a little help from on high, according to team manager Laura Funge, following Courtown's historic 2.5-0.5 win over Shandon Park. Following a nail=biting semi-final win over Ballina on Friday, Courtown had high hopes of ending their long wait for a national title and they were not to be denied. Catherine Quinn and Mary Osborne put Courtown one-nil ahead with a 6&4 win in the top match and with Stella Courtney and Mary Kilbride claiming a 4&3 win at number two, Eileen and her partner Mairead Sunderland were called in and the celebrations began. Rathfarnham and Smurfit claimed the remaining titles on the final day of the fourth edition of the AIG Ladies Cups and Shields. Carol Loftus clinched the winning point in the AIG Junior Cup Final as Rathfarnham beat East Cork 3.5-1.5. Once Lynda Keartland and Pamela Cassidy had carded early victories, Loftus, who was two up with three holes to play, produced a nerveless finish to give East Leinster its first green pennant since Dublin City won the Junior Cup in 2009. In the AIG Challenge Cup Final, Smurfit beat Macroom 3.5-1.5 with Maire Kearns defeating Noreen O’Sullivan in the 20th in the decisive match. 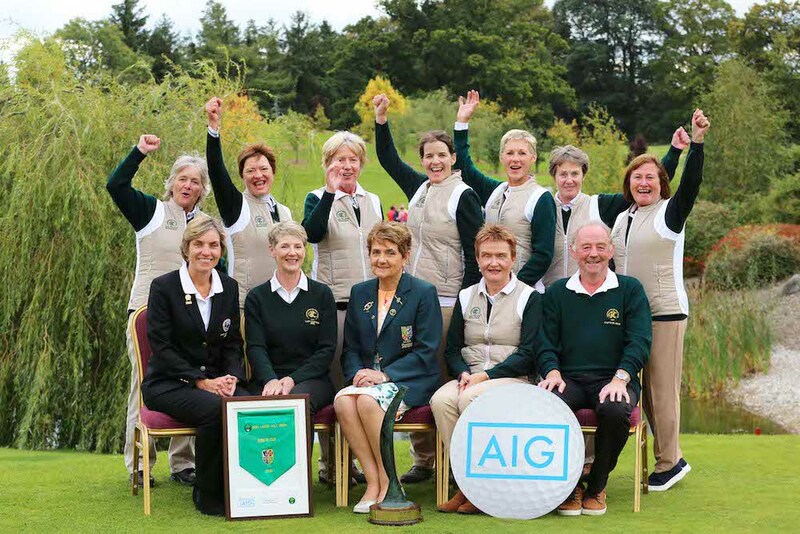 AIG has been the title sponsor of the AIG Ladies Cups and Shields since 2015 and ILGU President Vonnie Noonan expressed the Union's gratitude for their continued support. “AIG is a major sponsor of GAA Football, Hurling and Camogie teams as well as men’s and ladies tennis and amateur golf," she said. "We are privileged to be in the company of these great national sporting bodies. The AIG Cups and Shields will return to Knightsbrook in 2019.